Look at that R-E-A-C-H…. Gung Haggis stays ahead of boat 1 in the Rec D Championship Finals – photo Deb Martin. Congratulations to Gung Haggis Fat Choy dragon boat team paddlers! They conveyed a sense of teamship, caring for each other, and for community. They paddled their best, adapted to changing situations, changing rosters, and changing race conditions. Our paddlers improved with every race, both individually and together. as rotation, reach, entry, paddle angle, etc. faster and we could have medaled in Rec C Final. 10 seconds faster and we could have medaled in Rec B Final. It was great to have Manfred in the boat with us this weekend. manager Tzhe Lam for helping to organize the team, roster and leadership. Thanks to Keng and Gerard Graal to step in to drum and be land manager, after spending the past 3 weeks in Holland. involved in film documentaries and books on dragon boating! 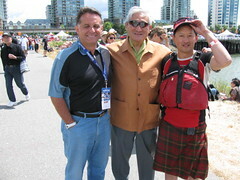 Todd Wong stands with dragon boat community friends Enzo Guierro (RTA DBF Race Committee) and Milton Wong (founding chair of the Canadian International Dragon Boat Festival Society), Todd served on the DBF race committee from 2001 to 2003. photo Steven Wong. More photos Click here: Rio Tinto Alcan Dragon Boat.. on Todd's Flickr site. This entry was posted in Asian Canadian Cultural Events, Dragon Boat Information, Dragon Boat photos 2003, Dragon boat with Todd Wong - Dragon Boat Coach, Gung Haggis dragon boat team information, Main Page, Multicultural events, Vancouver Area Adventures on June 22, 2009 by Todd. Dragon Boat Festival Chail Jas Kalsi talks about importance of a boat house for dragon boats on False Creek to sponsors, politicians and dragon boat festival organizers. The VIP tent was packed on the eve to the Rio Tinto Alcan Dragon Boat Festival. Politicians and digniteries walked in from the eye-dotting ceremony conducted by Taoist priests. Parks Commissioner and former Gung Haggis dragon boat team paddler Stuart Mackinnon dotted one of the eyes with a paint brush. Lots of great food was served in the VIP tent. Sockeye Salmon, Tuna on wild rice patties, corn chowder – all provided from the VCC culinary arts program. But this year's VIP party also had a serious tone. On Tuesday, the Canadian International Dragon Boat Festival Society had sent a letter to Vancouver City Council, stating that because of development on Falser Creek, the 21 year old festival was in jeopardy. Festival Chair Jas Kalsi talked about the issue to the audience. as Parks Commissioner Stuart Mackinnon, and Sen. Nancy Green Raine who said that the federal government will pledge $100,000 to the RTA Festival. is paddling in his first dragon boat race. Terry Hui, CEO of Concord said that Concord is committed to the Festival. Concord Pacific's senior vice-president of planning – Matt Meehan, who wants to come to the next Gung Haggis Fat Choy Dinner, as he remembers seeing me perform at Jenny Kwan's scotch tasting parties. Gung Haggis Fat Choy Robbie Burns Chinese New Year Dinners), and he told me which team his son is paddling on. I informed him that his son was being coached by one of our Gung Haggis paddlers Gayle Gordon. This entry was posted in Dragon Boat Information, Dragon Boat photos 2003, Dragon boat with Todd Wong - Dragon Boat Coach, Gung Haggis dragon boat team information, Main Page on June 20, 2009 by Todd. First race for GUNG HAGGIS FAT CHOY dragon boat team. Semi finals in the morning, Finals in the afternoon. Call Coach/Clan Chieftain Todd Wong at 778-846-7090 to find us! 24 Hours and News 11:30: Dragon Boat Festival being forced out of Vancouver? Where is the future Dragon Boat House on False Creek? For over the past 8 years, the Dragon Boat Community has been trying to ensure a boat house within the False Creek East Bay. This is before Vancouver was awarded the 2010 Winter Olympic Games and committed to the building an athlete's village in SE False Creek. If Vancouver had been awarded a Summer Games, would a rowing course similar to Montreal and Los Angeles Olympics had been created in SE False Creek? Public forums had been attended, and dragon boaters reminded planners to include dragon boating in their plans. I saw early plans that included a boating centre, and room to store boats, under the Cambie St. Bridge. But now the only parcel of land left is NE False Creek. The planned SE False Creek Community Centre, does not include a Community Boat House. On Tuesday, the Canadian Interenational Dragon Boat Festival Society sent a letter to Vancouver city council stating that the largest Dragon Boat Festival in North America, and its present Dragon Zone facility which provides year long paddling – is in jeopardy. In 1986, Dragon Boats were first donated to the City of Vancouver during Expo 86, from the Hong Kong Pavillion, thus kick starting dragon boat festivals all across Vancouver. Vancouver was the first North American city to hold a World Club Crew Championship in 1996. In 2003, the country of Taiwan donated Taiwanese style dragon boats to the City of Vancouver..
Vancouver's long-running Dragon Boat Festival is in danger of capsizing without help from City Hall. festival may be forced to relocate to another city. Coun. Raymond Louie called the festival a “mainstay of the city” and assured council is committed to the event. although it's not big enough to accommodate the festival's needs. visitors spend about $2.4 million over the weekend event. thousands who attend the festival. in 1989 the Canadian International Dragon Boat Festival was created. This entry was posted in Main Page on June 18, 2009 by Todd. Arlene Chan has written a new book on dragon boating. 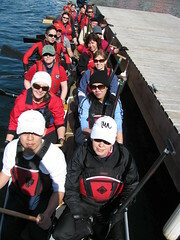 Arlene paddles on a Toronto dragon boat team. 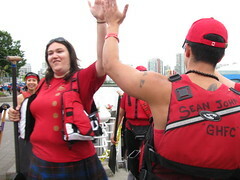 Susan Humphries is past president of Dragon boat Canada. Arlene wrote a children's book on dragon boating, Awakening the Dragon. This book features chapters on various topics written by top coaches, paddlers, and organizers from across Canada. Vancouver coach Kamini Jain, former Olympic kayaker, has written the chapter on coaching. passion for paddlers and coaches, like you. Toronto Public Library and had written two previous books, The Spirit of the Dragon: The Story of Jean Lumb, a Proud Canadian Citizen and The Moon Festival: A Chinese Mid-autumn festival. It's a small world. Arlene told me that Janet is her younger sister. Back in 2002, I was working for the Vancouver Asian Heritage Month Society. Janet is the founder and organizer of Access Asie, the Montreal version of Asian Heritage Month Festival. Sen. Poy is the patron senator of Asian Heritage Month in Canada, having had it proclaimed in parliament. Sen. Poy's husband Dr. Neville Poy had an aunt in Vancouver… who married my grandmother's eldest brother. “Auntie!” I called her. This entry was posted in Canadian Identity & Heritage, Chinese Canadian History, Dragon Boat Information, Dragon Boat photos 2003, Dragon boat with Todd Wong - Dragon Boat Coach, Main Page on June 18, 2009 by Todd. 4 days to go, and the Gung Haggis Fat Choy dragon boat team is ready for the biggest dragon boat festival in North America. 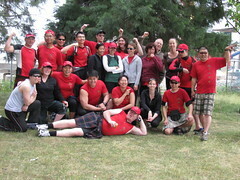 Gung Haggis team, after finishing 1st in Group B, at the June 6th afternoon Dragon Zone regatta. Wonderful practice tonight on Vancouver's False Creek waters.. we even had 30 paddlers show up for 20 paddling seats in a Gemini boat. We had 24 paddlers, then rotated drummer and steers throughout the practice. how seating arrangements and paddler abilities will be arranged. despite being a bit jet-lagged. was Alissa… With that dazzling new smile of hers! Video of a race start for a Gung Haggis dragon boat practice a month ago. Tzhe and Jane are lead strokes in this video – photo T.Wong. We are doing pretty good for our development this year. We hit the waters in March, wore our toque hats and have pushed our veteran paddlers while nurturing brand new rookie paddlers. Paddling in March – Left side from front: Karen, Steven, Christine, Danielle, Colleen. Right side from front: Joe, (somebody's brother guest paddling), Ernest, Diana, Stephen steering – photo Todd Wong. heads up to stay in time. Fun surprise of the evening was singing Happy Birthday to Danielle. come paddling with us, before going out to dinner with her husband. Tonight, after practice – the Gung Haggis team had a dinner social at The Clubhouse japanese restaurant. I showed dvd's of the documentaries we had been involved in previously. other teams. We could also compare and contrast our paddling styles. great rookies and second year paddlers now too! contrasting the premier Women's team with a mixed recreational team. of then coach Bob Brinson who also steered for us. to make me a dvd with all the footage of our team. Please arrive early with your wristband… and get lots of sleep the night before! 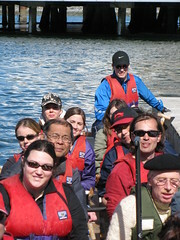 This entry was posted in Dragon Boat Information, Dragon Boat photos 2003, Dragon boat with Todd Wong - Dragon Boat Coach, Gung Haggis dragon boat team information, Main Page on June 17, 2009 by Todd. The Rio Tinto Alcan Dragon Boat Festival is the largest in North America. Dragon boat racing began in Vancouver BC, when the Hong Kong pavillion at Expo 86 donated 4 teak boats to the City of Vancouver. I started attending the festivals for the great entertainment and shows. It wasn't until 1993 that I first joined a team and started paddling. The Gung Haggis Fat Choy dragon boat team has been racing at Alcan Dragon Boat Festival since 2002. Prior to that I coached and paddled on many different teams at the novice, recreation and competitive levels. The Gung Haggis team emphasizes fun, fitness and multiculturalism. That's why we wear our kilts while paddling a Chinese dragon boat tradition. We have been asked to participate in two film documentaries. One is a feature film titled “In the Same Boat”, directed by Alfonso Chin and produced by Jacqueline Liu for Rosetta Entertainment. Alfonso used to paddle for the CC Riders team, and our paddler/drummer Keng Graal used to be one of his teachers. The second film is a multi-part series called “Chinatown Canada” produced by Kerri Beattie of Image Pacific. 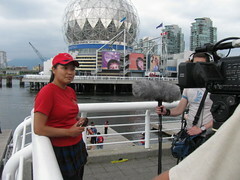 They will be interviewing me about Vancouver Chinatown, and filming our Gung Haggis Fat Choy dragon boat team in action, as one of the cultural off shoots of Chinatown. We will be working out our final race strategies, and finalizing seating arrangements. Some of the paddlers have been away, but have returned just in time. We have four brand new paddlers who raced their first races ever in May and June. We have two more brand new paddlers who have yet to experience a full race with 7 or more boats. Our core veterans have been with the team for 4 years or more. We have added some paddlers who have experience with other teams. This could be the best Gung Haggis team ever. But our roles at drummer and steers are not settled yet, and we might be rotating people. There is a dvd machine in the upstairs party room. This entry was posted in Asian Canadian Cultural Events, Chinatown Vancouver, Cultural Fusion, Dragon Boat Information, Dragon Boat photos 2003, Dragon boat with Todd Wong - Dragon Boat Coach, Gung Haggis dragon boat team information, Main Page, Upcoming Events, Vancouver Area Adventures on June 16, 2009 by Todd. Toddish McWong, telling stories at 2008 Celtic Fest for the Battle of the Bards, and reading Robert Burns poetry – photo D. Martin. It is Car Free Days starts at 12 noon at the following locations. I will tell stories about how James Douglas was born in Guyana to a Scottish father and a Creole mother, and came to BC to become the first governor of BC. I will look south to the Fraser River, and recount how Simon Fraser was born in the United States, came to Canada with his Loyalist mother, and travelled through Western Canada, to explore this Westernmost land and named it New Caledonia. The SFU Gung Haggis Fat Choy Festival, by SFU Recreation department. This entry was posted in Asian Canadian Cultural Events, Chinese Canadian History, Hapa culture, Kilts - wearing kilts, Literary Events, Main Page, Multicultural events, Scottish, Gaelic, Irish Celtic events and stories, Todd Wong, Upcoming Events, Vancouver Area Adventures, Vancouver Heritage and History on June 14, 2009 by Todd. Mixie & the Half-breeds theatrical play tackles the issues of Asian ancestry in a Mixed Race Canada. Many Canadians are of mixed heritage. The Métis are mostly descended from First Nations and French-Canadian heritage. But what if you are part Asian? Adrienne Wong and Julie Tamiko Manning might consider themselves Hapa, or Hapa-Canadians, as they count Chinese and Japanese as part of their genetic and cultural heritage. Many well known actors are Hapa, such as Keanu Reeves, Kristin Kreuk (Smallville), Meg Tilly, Jennifer Tilly, Dean Cain (Adventures of Lois and Clark), Jason Lee – the son of Bruce Lee(The Crow), and even Kate Beckinsale. They all have Asian ancestry. Piano performers Jon Kimura Parker, James Parker, and their cousin Ian Parker. Rocker David Usher is Hapa, as is Sean Ono Lennon – the son of John and Yoko. Adrienne performed an excerpt from Mixie and the Half-Breeds at the 2009 Gung Haggis Fat Choy Robbie Burns Chinese New Year Dinner. It was an inspired performance, perfect for an event that highlights cultural fusion. She talked about growing up confronting the issues of belonging to this group or that group, but emphasizing her own uniqueness. AND… Adrienne congratulated ALL the “Mixies” in the audience and threw licorice Twizzlers to them! I've known both Adrienne and Julie for a number of years, and seen them both perform. I am looking forward to this production which opens on June 19th, at the Vancouver East Cultural Lab. The Vancity Culture Lab at The Cultch 1895 Venables Street. Eggs, bananas and an aversion to rice. A no-holds-barred identity throw-down, Mixie and the Halfbreeds is an optimistic tale for a remixed nation. Stay after the show for a chat with the cast. Presented in partnership with the Powell Street Festival. Derksen and Jay Hirabayashi (Kokoro Dance). Guido Heistek leads a post show jam. Novice and experienced strummers welcome. Bring your own ukulele or borrow one of ours. Kirsty Munro. Shirts are on display in the lobby throughout the run. This entry was posted in Main Page on June 12, 2009 by Todd.